Downed Pasterns and How to Treat Them in a German Shepherd puppy. What causes downed pasterns in German Shepherds? The answers can easily vary from person to person. Some think that it may be from a high protein diet that overcompensates while others feel that it is simply hereditary. No matter what the reason may be, you need to help your German Shepherd puppy if you notice one day that it is walking on it’s pasterns instead of on the pads of the feet. One of the first things you should do if you notice that this has happened to your GSD is to read the ingredients list on your dog food label. Pay particular attention to the protein level listed on the bag. Ideally, the protein level for a dog with this condition is around 21%. If your dog food does not have a high percentage of protein you need to purchase dog food that does and gradually wean your dog up to the 21% protein food while mixing in smaller and smaller amounts of your original dog food each meal. Make sure that you do this switch over several days to cause as little stomach upset to your puppy as you can. Try this for several days and see how the puppy reacts to the new higher protein food. If the downed pasterns still haven’t come back up on their own try the following: add one Maalox® tablet (200 mg per tablet) to the pup's morning and evening meals. This has always worked for me in dogs that are not severely down in their pasterns and walking on the next joint above the pads. Pictures of normal pasterns and of downed pasterns appear in this article as well to illustrate the point further. This article is written in hopes of offering a “what to do” guide in the event that this happens to your German Shepherd puppy. Use a dog crate to limit exercise and only let the puppy out for bathroom breaks and for very, very limited exercise. Then, try this plan given me by a good friend and top breeder of fine German Shepherds for many, many years. It works really well for puppies with more severe downed pasterns that do not respond to the Maalox® routine alone. Put the German Shepherd puppy back on the 21% diet, and add the following each meal: add one Maalox® tablet (2 times per day), add 800 units of vitamin e, 1000 mg vitamin c and 1 Selenium/Magnesium tablet. Make sure that you are under veterinary care as well and don't give up. Treatment may take some time before your puppy gets back to normal. I would encourage you to keep the puppy on the vitamin-Maalox routine listed above for a few weeks even after the puppy's pasterns gets back to normal. It is also a good idea not to put your puppy back on a high protein diet even though you might want to increase it just a bit, especially if your treatment is being done on a young puppy. Your veterinarian may encourage you to euthanize the puppy. Please don't, at least not until you give the treatment above a try. Who knows what kind of results you will get? I do know personally that I have used the treatments above in puppies of my own and they have worked well and the pups went back up in their downed pasterns in just a short time. 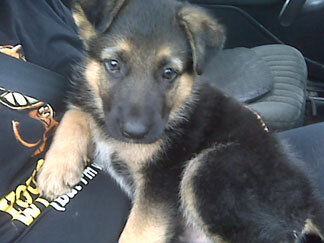 Don't give up and you may be pleasantly surprised at what a beautiful animal your German shepherd puppy develops into. Downed pasterns can be overcome with the correct treatment, patience and time.